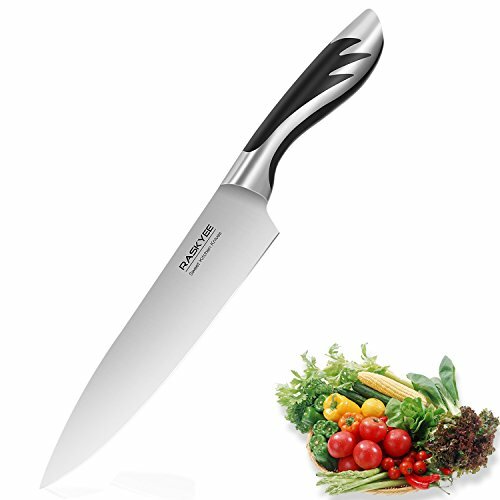 THE QUALITY OF GERMAN STEEL: Raskyee has designed this 8-inch professional chef knife with rust resistant German 1.4116 stainless steel. The sleek, high carbon kitchen knife is a must-have cutlery that everyone should have in their kitchen equipment! Cooking will be so much easier with this chef knife! THE SHARPEST, SLIMMEST BLADE: The Raskyee chef knife has a super slim (2.5mm) and incredibly sharp blade that can cut, slice, chop and dice any food and ingredient you want! The blade of the stainless steel knife can be sharpened, but, trust us, you won\'t need to do that anytime soon. LARGE YET EASY TO CONTROL: Even though the stainless steel chopping knife is large, it is very easy to control. Thanks to the ergonomically designed ABS handle, you will have the most secure and comfortable grip and you\'ll be able to handle the cooking knife like a professional chef! COMES IN A LUXURIOUS GIFT BOX: The professional kitchen knife comes in a beautiful box, so you can give it as a gift to a friend or family member who loves cooking! They can then keep the gift box so that they can store the steel chef knife, to keep it clean, protected and away from children. A 100% RISK-FREE PURCHASE:our goal is to ensure that you are happy with Raskyee sweet kitchen knife,there is no risk for you with our 100% Satisfaction and Money-Back Guarantee ! If you have any question or concerns about Raskyee chef knife ,don\'t hesitate to contact us ,we\'ll work with you till you\'re satisfied ! Sharp Edge; Great Weight; Many Uses! Strongly built and at the same it is very light. Very sharp makes cutting easy and precise.